Call it Autopilot, Autonomous Mode or anything else, it has been a terrible couple weeks for the technology, seeing as at least two people lost their lives in accidents involving vehicles that weren’t being driven manually by human drivers at the time of the collisions. Both incidents took place in the US, and while one of Uber’s autonomous vehicles was involved in the Arizona crash that resulted in the death of an innocent pedestrian and prompted the state’s governor to suspend the company from testing its self-driving vehicles pending further investigations, the other fatal crash happened in California, where the driver of a Tesla Model X was fatally injured when his vehicle crashed headfirst into a highway divider. A week on, Tesla has released a report following an internal investigation into the deadly crash, confirming that the car was, indeed, on Autopilot, as was being speculated. The company, however, claims that there’s no way to tell if its technology is to be blamed for the crash, or if there were other extenuating circumstances that led to the tragedy. According to the company, its investigations apparently show that the driver’s hands weren’t on the wheel for six full seconds before the collision, and he took no action despite having five seconds and about 500 feet of unobstructed view of the highway divider. The company further sought to blame the authorities by claiming that “the crash attenuator, a highway safety barrier which is designed to reduce the impact into a concrete lane divider, had either been removed or crushed in a prior accident without being replaced”. The company provided the following images in support of its claim. The accident happened on March 23 when the aforementioned vehicle, being driven by one Wei Huang, crashed on Highway 101 near Mountain View, California. Stranded in the middle of the highway, the car, with the incapacitated driver inside, was further struck by two different cars before catching fire. 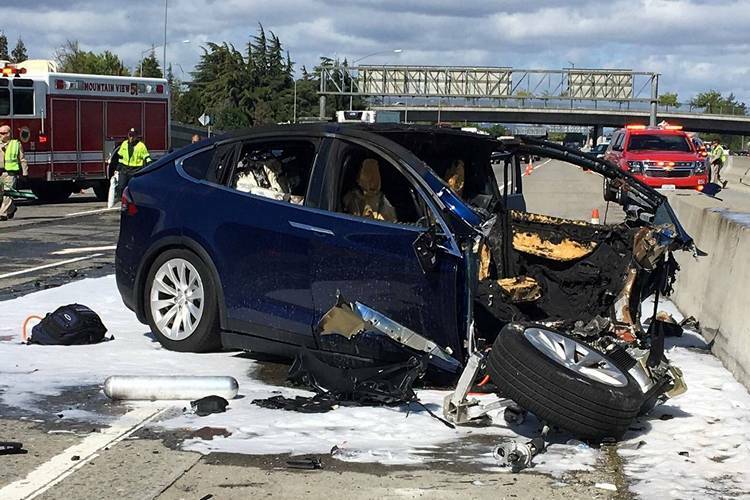 Investigators are also looking into whether the firs started because of the battery in the Model X, although, Tesla claims that its batteries are specifically designed to prevent ‘thermal runaway’ – the vicious cycle that results in severe heat build-up from chemical reactions that occur when batteries are exposed to external heat.